Last week we looked back on that time I was interviewed on Huffington Post. but today I want to go revisit another special moment back in the day. Back in November of 2013 I was at a client’s home teaching a private cooking class. 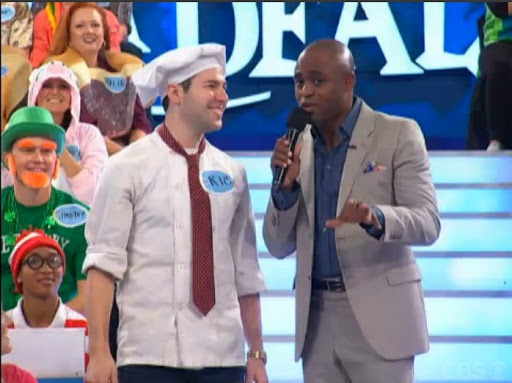 One of the kids named Eliana, about 8 years old at the time and was OBSESSED with the gameshow “Let’s Make A Deal” In between recipes, we’d watch a few a few minutes here and there. “Then why don’t you?” she said, baiting me and pointing to her computer. “Easy enough,” I said as I went on the computer and signed up for a taping of the show in January. A few months went by and I completely forgot about the taping. An email popped reminding me to attend the game show and be in the audience dressed in costume. Originally a friend had agreed to be my plus one, but he bailed at the last minute. Still, I decided to go “in costume” and see what it was all about to see a taping of a gameshow. For those who don’t know, “Let’s Make A Deal” is a game show that’s been around since the 60s and was originally hosted by Monty Hall. It has a simple premise where audience members play games and try to win prizes. Sometimes they are asked to choose what’s behind Curtain 1, 2 or 3 where there could be a prize or a “zonk” which is a non-prize. Since 2009, it’s been hosted by the hilarious comedian Wayne Brady . Equipped with my chef coat, chef hat, spatula and a bright red tie, I headed to the TV studio taping bright and early on a Saturday morning. In the studio, I found out how the screening process worked and INSTANTLY knew I had a chance of being selected. There were about 200 people in the audience and about 20 ways of being on camera to play a game and win a prize. Those are good odds. I’ve been a camp counselor for YEARS and knew how to bring the energy when needed. When it came to my turn I was spirited and told them about my cool gig teaching kids to make healthy pasta. It’s true what they say: On TV, the set looks huge, but in reality these sets are quite small and compact.. When the show started, Wayne appeared and the crowd BURST into applause. I was super excited and as Wayne introduced himself to the camera, he went on to choose three contestants and MY name was the first one called! I felt like my body was going to light on fire as I stood up in a haze of excitement and shock and walked down to the stage. Wayne introduced two other contestants as well. He interviewed me and when I told the audience I taught kids to cook they cheered! The other two candidates were a med student and a veteran. I looked at the curtain, suspiciously. It could have a prize OR it could be a “zonk,” a non-prize. Suddenly, the curtains parted and in front of me were TWO VESPA SCOOTERS. The audience SCREAMED with excitement at my win. I had the biggest smile on my face as Wayne ushered me to go forward and check out my prize. I stood there and gazed in wonder at my scooters! After the win, they cut to a commercial break and I walked back to my seat. Everyone in my row was giving me thumbs up and high fives. 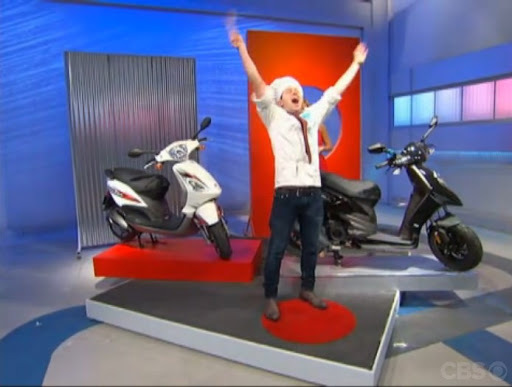 The show had been on for all of 5 minutes and I had won not one, but TWO scooters in front of a live studio audience and what would be 3,000,000 viewers at home. Little did I know what would happen later in the show. But that’s for next week, as this post has gone on long enough. P.S. Keep teaching your kids to cook healthy foods in 2019! Join the BEST after-school cooking class around here.